The GenreCast continues to march through March and the Women's Appreciation Marathon. This week, we're tackling Penelope Spheeris' Wayne's World, starring Mike Myers and Dana Carvey. The popular SNL-sketch-turned-film was a cultural touchstone for many Gen-Xers and cusp millennials. 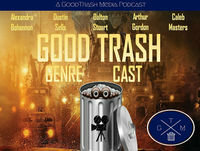 And, we're making this a family affair as Dalton's sister, Carissa drops by to talk about one of the Stuart children's favorite films growing up. We crank it to 11, and drain all of the jelly-filled analysis from Wayne's World. Get into it!